- Officials of this heritage town continues to pursue innovations for the age-old terra cotta industry that has sustained generations of families of pot-makers. The pottery products, locally known as “damili,” is San Nicolas’ one–town–one product (OTOP) owing to its unique heritage culture and art. “We are now planning the strategies to upgrade our pottery industry products specifically its quality and its design to further increase its demand not only for cooking wares but also for ornamental purpose,” said Mayor Melanie Grace Valdez. The town’s potters or the “agdamdamili” (an Ilocano term for pottery) started exploring the need to expand their venture in the production of other pottery products during the term of former Mayor-now Vice Mayor Alfredo Valdez, Jr (husband of Mayor Melanie). 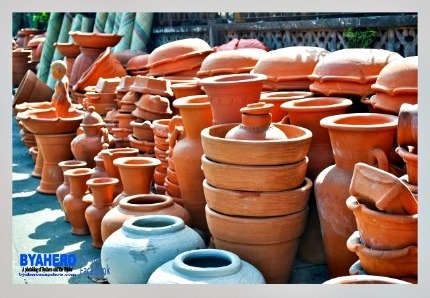 Some of the producers’ popular products include “red terracotta” pot (or Ilocano “banga”), cooking pot and water pot including pipes (lusob), tiles and bricks with various sizes and artistic designs. “The development of our pottery industry started when my husband, (then Mayor Valdez) made several initiatives to encourage our constituents to venture and revive our pottery making industry,” Mayor Melanie Valdez said. She said many local potters were sent to other places to train and upgrade their skills. Then Mayor Alfredo Valdez also established a large oven for uniform cooking of pottery products, she added. She said residents engaged in pottery making had already tripled. “At present, we are now encouraging the big business industries not only in the province but also in Metro Manila to use our local tiles and bricks products for their building constructions and landscaping,” she said. To further promote the tourism aspect of pottery making, local officials derived Damili as the title of the town’s annual feast “Damili Festival” held in December. Festival highlights included the street dancing pageantry and dance showdown. The contigents from the 24 barangays composed of students, clad with elegant and colorful clothings, danced gracefully as they demonstrated the process of damili.